Help your students advocate for themselves with organized written letters and visuals. These forms (png, 300 dpi.) were designed to make student self-advocacy quick, painless, gentle, and maybe even fun! Help students advocate with alternate assignments, empower them with Learning Styles, and encourage them to share their emotions. Visuals are more appropriate for and feature children from upper elementary, middle school, and early high school. 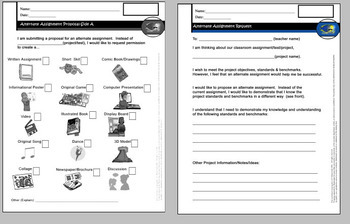 Student Advocacy Sheet- Similar to Confidential Note to Teacher, but deals more with a specific class project or assignment and provides student with an opportunity to explain to the teacher in advance that they may need extra support (and why). My Emotions- Students use a simple visual/checklist form to express how they feel without using any words. Planner Substitute- Left the planner at home? Use this quick sheet to get the information you need for the day. Learning Styles Survey Side A-Get to Know Me- Provides teachers with an opportunity to learn more about their students. 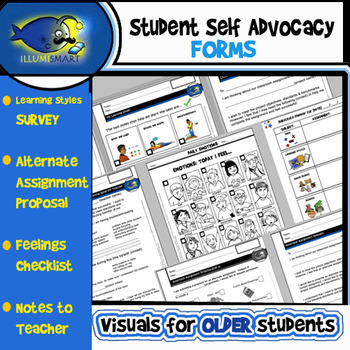 This product (Student Self-Advocacy Forms) may be used for personal, educational, and non-commercial use. This bundle/images contained is for private/classroom use only. Please consider purchasing Illumismart Clip-Art for your TPT products.